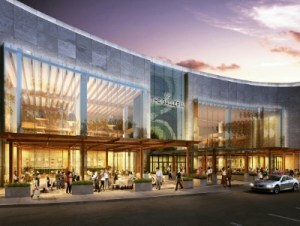 The Galleria is a mixed-use project with a Simon mall in Houston. By Michelle Leigh Smith — Once again, move over Dallas. Houston has you beat with a world-class dim sum destination and tea house/restaurant with two bars. The concept, which originated along China’s Silk Road when weary travelers were offered tea, reaches a new level of quiet elegance. Inside Yauatcha, guests share amazing adn carefully curated teas. Fulfilling the vision and concepts of Chef Ho Chee Boon, the Houston eatery serves up venison puffs for the main course and an enticing Chocolate Pebble made from three kinds of chocolate for dessert. The most expensive entrée, the Peking Duck Tsar Nicoulai Reserve Caviar goes for $238. Yauatcha, 5045 Westheimer, is in the new standalone 14,000-SF “jewel box” building that was recently constructed on the parking deck at the Galleria. It was part of a $250 million redo of the Galleria that included the development of a new Saks Fifth Avenue store. Simon, the mall owner, is also reported to be considering adding a Ritz-Carlton hotel at the Galleria. Launched in SoHo London in 2004, this unusual restaurant gained immediate critical acclaim and receiving its Michelin star within a year of opening. The long anticipated Houston eatery welcomes diners in a warm and sleek atmosphere designed by Paris-based GBRH. The comfortable décor highlights the five colors of feng shui elements, in blue, yellow, red, black and white throughout the 10,200 SF space. Yauatcha attracts a young, vibrant international crowd and is open for lunch and dinner. For those who are new to the dim sum mystique, Assistant General Manager Jonathan Li can select an interesting first foray. Assistant GM Laney Collum, who comes via experience at Pass & Provisions, consistently checks on guests and shares her genuine excitement. Yauatcha management consultant Gigi Huang, who independently and with her father James Huang has developed eight restaurants in Houston during her 38-year career in dining, stopped by to say hello. “I am running late because I just sold a house in the River Oaks area,” said Gigi, who works with Martha Turner Sotheby’s International Realty. Hakkasan Group operates restaurants in Waikiki, Las Vegas, Miami and New York. This is the first Yauatcha location on the U.S. Mainland and the second in America, joining sister outposts in London, Dubai, and New Delhi, Mumbai, Bengaluru and Kolkata, India. Hakkasan Group is fully owned by Alliance International Investments LLC, based in Abu Dhabi. Its restaurant portfolio includes Hakkasan with 11 locations worldwide, Ling Ling, Yauatcha, HKK, Sake no Hana, Herringbone and Searsucker. Under the nightlife/daylife umbrella of brands are Hakkasan Las Vegas Restaurant and Nightclub in the MGM Hotel, Wet Republic Ultra Pool, OMNI and JEWEL Nightclubs.